After I got back from Hamamatsu, I stopped at Tokyo station to have dinner at Ramen Street, which is located on the basement floor in the retail complex 1st Avenue. There are 8 ramen shops located in this ramen-dedicated part of the station, and all the major ramen styles are represented. The most popular ramen shop at Ramen Street is Rokuinsha, which is famous for tsukumen dipping noodles, but as you probably know by now, I’m a tonkotsu (rich, pork-based broth) kind of girl, so I headed for Ikaruga instead. I purchased my ramen voucher in the vending machine and lined up. In addition to different kinds of ramen, you could also purchase gyoza (Japanese dumplings) and other sides as well as different beverages. At most ramen shops, the ramen bowls are so large that it takes quite an appetite, just to finish the ramen, so usually I skip the sides. Sometimes I order a coke or a beer along with my ramen, but plain water or green tea, which is complimentary, is often the best match. 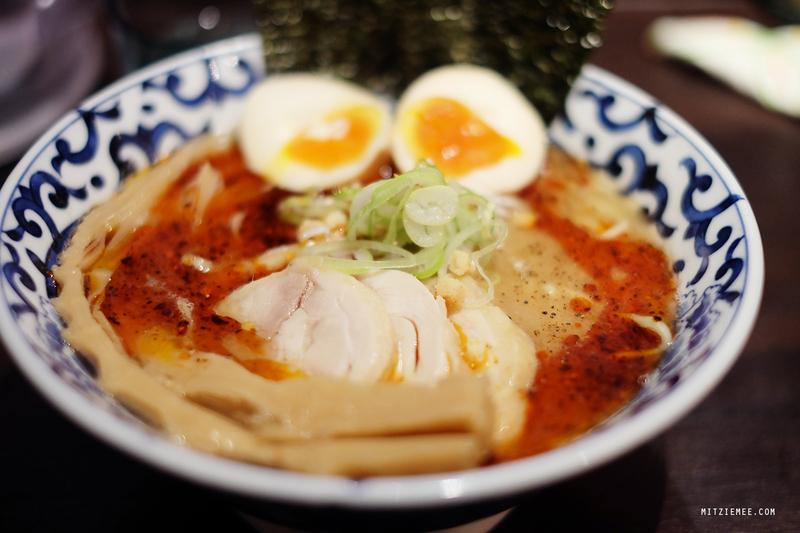 It didn’t take long to get a seat, and only a few minutes later a big bowl of divine tonkotsu ramen arrived. Turned out, I had ordered the spicy ramen, so it came with a dash of chili oil, which actually went really well with the heavy broth. Slurp, slurp, slurp and the ramen was gone.